There are 559 centerline miles, or 2,840 lane-miles, of pavement on the Thruway. The original Thruway pavements were constructed using a 9" thick concrete pavement. Over time, this concrete pavement was overlaid with asphalt. The condition of the pavement below the surface is a major concern when deciding how best to repair, rehabilitate or reconstruct roads, as surface treating the asphalt on top of the concrete does not address underlying concerns including drainage, poor soils and broken concrete slabs. The condition of the original concrete slabs and the material underneath these slabs may, or may not, be in good condition. 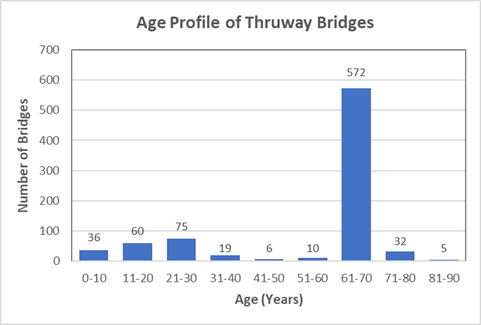 Figure 1 provides an overview of the age distribution of Thruway pavement surfaces. 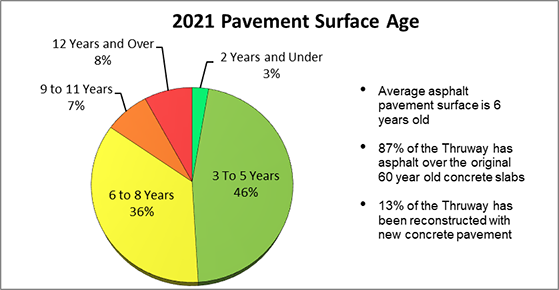 The average five-year old surface is supported by the original 60-year old concrete slabs and subgrade materials. Each roadway section is inspected annually using specialized equipment to measure ride quality and through field reviews by engineers to assess surface conditions. From this data collection effort, the underlying condition of the pavement can be inferred. Based on these inspections and measurements, condition ratings are developed to represent each roadway section. Ride quality is measured using special laser sensors mounted on a vehicle traveling at highway speed. Each year, an Automated Road Analyzer (ARAN) vehicle is used to collect ride quality measurements, rut depths and a video of the roadway pavement surface. The ride quality measurement, recorded in inches per mile, indicates how smooth or rough the road rides and is expressed using the International Roughness Index (IRI). The Federal government has established standards to describe ride quality using the IRI. Based on these IRI standards for U.S. Interstate-style roadways, 75% of the Thruway is rated Good or Very Good. Figure 2 shows the average Thruway IRI for 2016 was rated Good, with an IRI of 82 inches per mile. 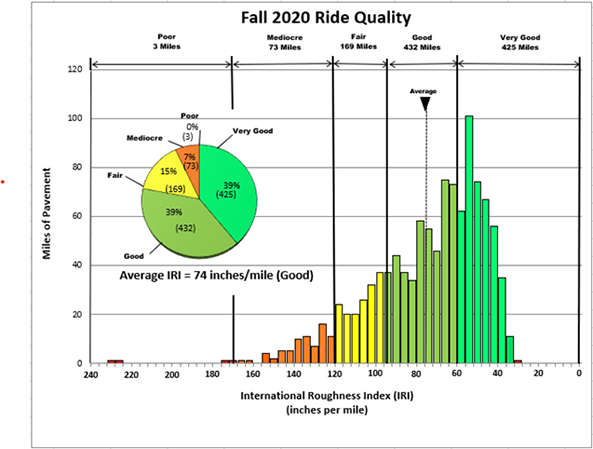 Figure 3 represents the average ride quality using IRI measurements across the Albany and Syracuse Divisions of the Thruway for a two-year period. This jagged-style graphic shows the variability of ride quality across the Albany and Syracuse Divisions and clearly illustrates where the road is Good, Fair, or Poor. Data is plotted in one-mile increments. 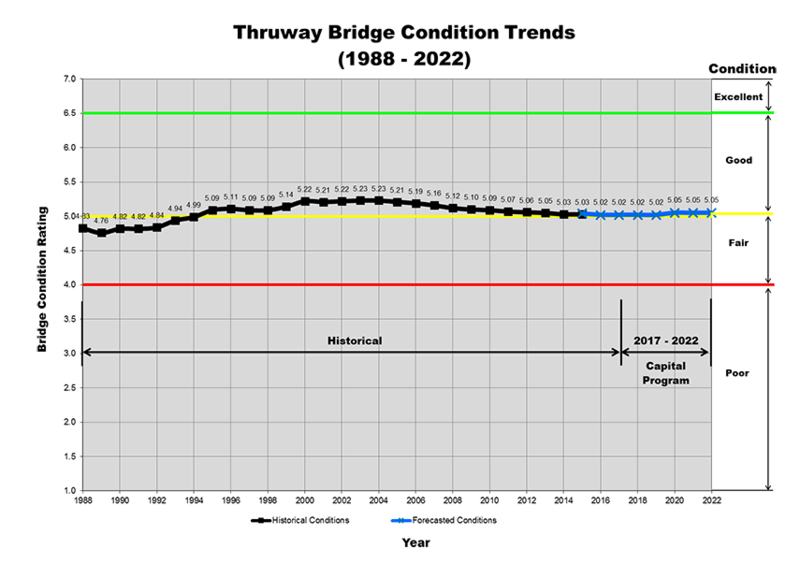 The black line shows the average IRI for 2016 and the light blue line how the road rated during 2015. Orange shading indicates this particular section of the road also has congestion-related concerns. 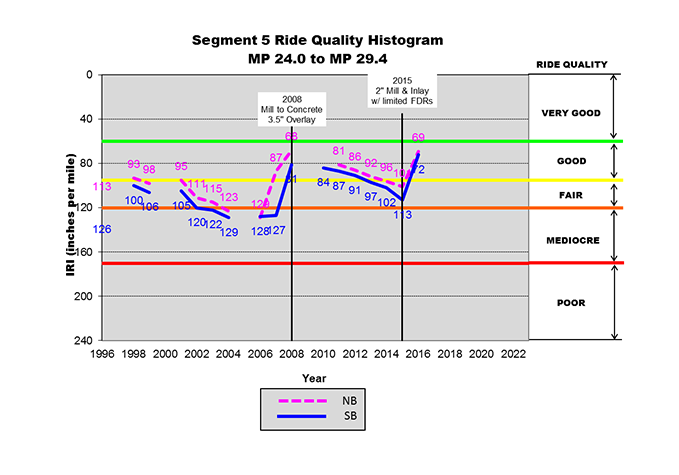 Ride quality is further analyzed by planning segment. This is determined by using IRI measurements averaged over each planning segment. The entire Thruway is broken up into 72 planning segments. Each planning segment is based on the past paving project limits in that particular area. Planning segments are useful in representing the condition of the road and identifying future projects. The average IRI for each planning segment is calculated and plotted on this jagged-style graphic. Figure 4 shows the variability of ride quality across the Albany and Syracuse Divisions from a planned paving project perspective. This helps to clearly illustrate where the road ride quality is Good, Fair, or Poor, and assists with project prioritization. Again, the black line shows the average IRI for 2016, and the light blue line how the road rated during 2015. Orange shading indicates this particular section of the road also has congestion-related concerns. Figure 5 shows a detailed view of the past and current IRI for a particular section of the roadway. Each section of the road can be diagnosed using this tool, and predictions of where, and at what time, the ride quality will reach unacceptable conditions can be determined. The year a particular section of pavement is planned for resurfacing or other work is shown in the white and yellow boxes. 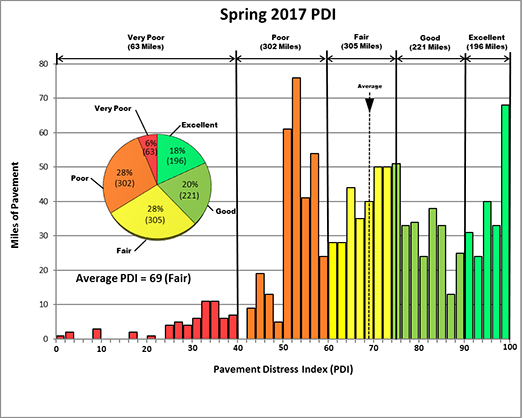 The Pavement Distress Index (PDI) characterizes the extent of pavement surface damage. The index helps prioritize where to pave and how invest. It also helps forecast future paving needs and locations. A PDI is calculated from pavement surface distress inspections and ratings. The Thruway generates the PDI through manual pavement inspections - two engineers visually observe the pavement surface conditions from a vehicle traveling at low speeds along the shoulder. Individual ratings are collected for each mile of the road and converted into the PDI. The PDI is then averaged over specific Thruway planning segments, which vary in length from 5 to 15 miles long. 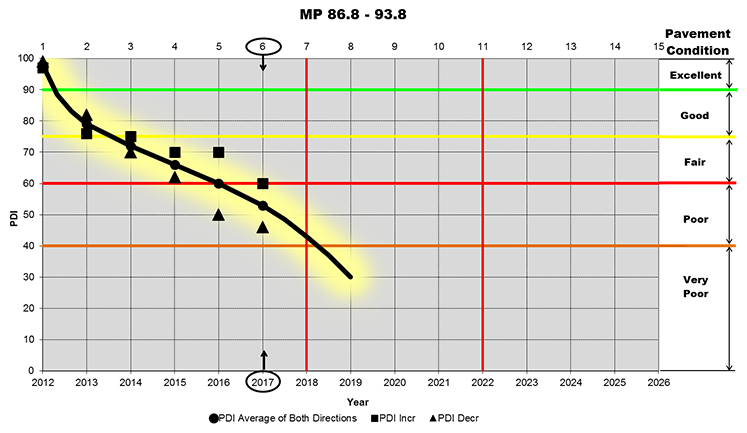 Figure 6 shows the average Thruway pavement surface condition using PDI is characterized as Fair (69), with 38% of the road rated Good or Excellent. Figure 7 represents the average pavement condition ratings in one-mile increments using PDI across the Albany and Syracuse Divisions of the Thruway. The relative surface condition of the road is categorized by Excellent, Good, Fair and Poor. Orange shading means this particular section of the road also has congestion-related concerns. Figure 8 represents the average pavement condition ratings, expressed with planning segments, using PDI across the Albany and Syracuse Divisions of the Thruway. The relative surface condition of the road is categorized by Excellent, Good, Fair and Poor. Orange shading means this particular section of the road also has congestion-related concerns. 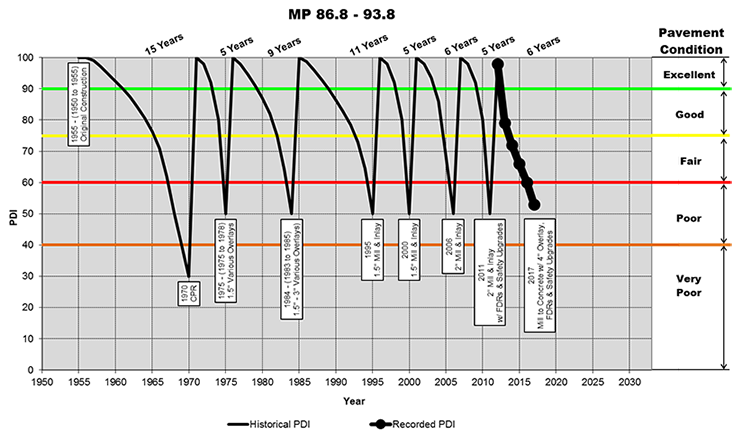 Figure 9, the "Sawtooth" style graphic, demonstrates how the PDI changes over time for a particular segment of the roadway. It shows the useful life of a pavement decreases over time. With this new tool, the Thruway Authority can better and more consistently predict where and when to pave each segment of the road and select the best treatments to keep it in Good condition. Figure 10 shows a more detailed view of the current and projected condition for a particular section of the roadway. Using this tool, each section of the road can be diagnosed, and reliable predictions of where, and when, to pave can be made. Pavement Asset Management focuses on prioritizing and deciding on the most cost effective and appropriate treatments for roadway segments, to keep condition levels within acceptable ranges. Roads rated Poor may show signs of surface deterioration including: cracking, potholes or patches, rutting, bumps and heaves or poor ride quality. Some sections of the road in Poor condition can be resurfaced using a 'mill and inlay' type of treatment. This treatment type restores the surface condition and ride quality by eliminating cracking, potholes and patches, providing many years of service at a relatively low cost. Mill and inlay treatments, however, may not be effective in other locations due to the underlying deteriorated 60-year old roadway base and/or poor drainage. Additionally, for each section of the road, a complete maintenance and Capital Project history has been developed. Also accounted for are: high traffic volume (congested) corridors, heavy truck loadings, and project coordination requirements. These factors are all considered in project selection and prioritization methods. The Thruway Authority inspects and maintains 814 bridges. Bridge reliability is critical to public safety and the continuity of the Thruway System. Figure 11 shows that as of 2017, there are more than 500 bridges which are over 60 years old, including several major bridges. Many of these bridges, while they are safe for travel, need rehabilitation work or costly replacement. In accordance with New York State and Federal Law, a Professional Engineer inspects each Thruway bridge every two years, at a minimum. Each inspection is documented with a written report, which provides a detailed description of the condition of the bridge and identifies any safety concerns. 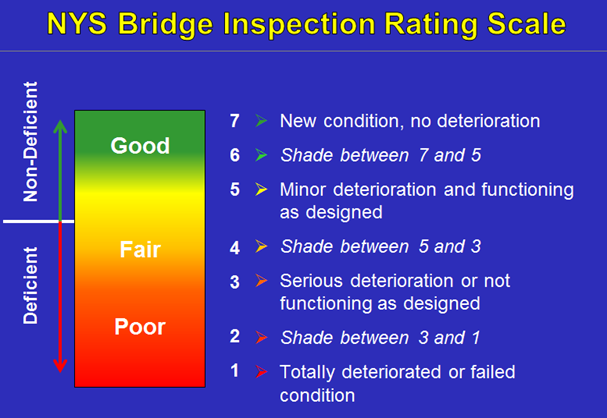 Figure 12 explains the bridge rating scale used in New York State bridge inspections prior to 2016. The overall condition and safety of each bridge is summarized by its Bridge Condition Rating (BCR). 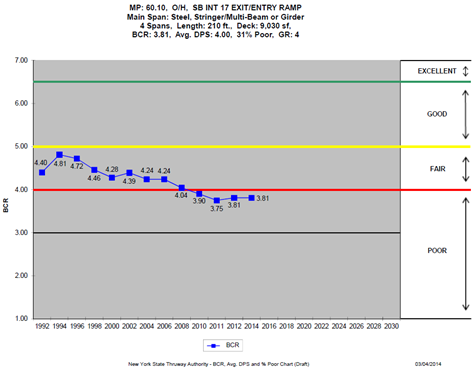 Figure 13 shows the long term trend for the Thruway BCR as of 2015. 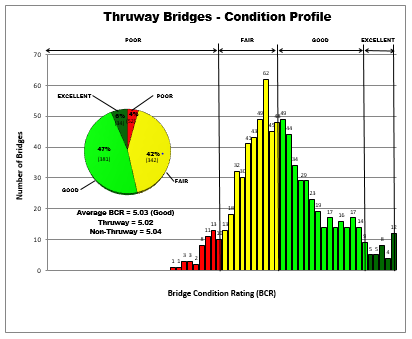 Figure 14 shows the average Thruway BCR in 2015 is Good at 5.03, with 53% rated Good to Excellent. Bridges in Poor condition can pose risks. If a bridge is inspected and rated as Poor, one or more of the following may be required to stabilize the bridge to a safe and good condition: weight and/or lane restrictions, temporary repairs or closures or longer term repairs included in the Capital Program. Figure 15, the jagged-style spine graphic, shows the BCR in 2015 in the New York Division of the Thruway. The solid circles show the BCR for each bridge which carries Thruway traffic and the open circles show the BCR for overhead bridges which do not carry Thruway traffic (overhead bridges which cross the Thruway). This graphic conveys the overall condition of each bridge in simple terms of Excellent, Good, Fair and Poor. Locations which also experience congestion are shaded in orange. Figure 16 shows a photograph of a bridge located at the Newburgh Interchange which crosses over the Thruway. Figure 17 shows the BCR trend, as of 2015, for the past 20 years for the same overhead bridge (Figure 17) near Newburgh Interchange. Comparable data for each of the 809 Thruway bridges is analyzed in detail by a multi-disciplinary team to determine the type of work needed to keep the structures safe and in serviceable condition. The Bridge Asset Management System is designed to reflect the unique characteristics of the Thruway system of bridges; it contains objective, coherent and integrated decision making processes which are data driven and replicable. By incorporating 20 years of BCRs, inventory data, structural details and vulnerabilities, highway safety data and capital and maintenance history with operational concerns for each bridge, this information can be used to develop and prioritize Capital Projects, as well as establish long-range plans for each structure. The goal of the Bridge Asset Management System is to establish long term programmatic planning by maximizing the remaining safe service life of the Thruway bridge population, while addressing non-condition related vulnerabilities. Each bridge receives a thorough diagnosis of its history, structural condition, design details and operational needs. Bridges classified as being in Poor condition tend to be in the later years of their useful life and generally require major rehabilitation or replacement. Bridges in fair condition typically require rehabilitation and preservation actions to correct the adverse effects of age, traffic loading and the environment. This type of work includes major structural deck rehabilitation, joint replacement, bridge bearings, rehabilitation replacement and substructure repairs. Bridges rated Good and Excellent still need work to keep them in good condition and protect them from deterioration. Typically corrective maintenance, minor repairs, or both are sufficient to maintain their rating for an extended time period. Good to Excellent bridges also require preventative and cyclical maintenance including: bridge washing, jacking and lubing bearings, sealing concrete, joint repairs, spot and zone painting and cleaning drainage devices such as inlets and scuppers.